A recent gift by Stanley B. Burns, M.D. substantially increases the holdings of daguerreotypes at UMBC. 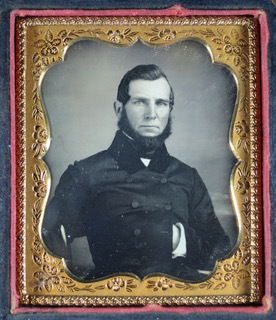 Dr. Burns, historian, collector, and physician, donated 252 daguerreotypes from his large photography collection, continuing his long relationship with UMBC. More than seventy different photographers are represented among the signed works, including recognized daguerreotypists such as Charles Deforest Fredericks, Rufus Anson, John Plumbe, Jr., Samuel Broadbent, and Jessie Whitehurst. The unsigned works are unattributable to any specific artist but hold significant value for the uniqueness of the imagery, the interesting representations of nineteenth century people, and the material culture characteristics. As an historian, Burns has written over 1,100 articles and over forty books on subjects ranging from Victorian funeral portraits to early oncology. His books Sleeping Beauty: Memorial Photography In America, and Forgotten Marriage: The Painted Tintype & The Decorative Frame, 1860-1910, A Lost Chapter in American Portraiture both received American Photographic Historical Society awards for best publications, and Sleeping Beauty was praised by Pulitzer Prize winning author John Updike in American Heritage magazine. Images from the Burns Archive have been utilized for such nationally and internationally distributed television programs and motion pictures as The American Experience, Hannibal, The Knick, and Silence of the Lambs. Images: Header image is UMBC Library, by Marlayna Demond ’11 for UMBC. Daguerreotype is “Sea Captain in Typical Distinguished Pose,” by J. H. Young, 1850s. Photography Collections, Albin O. Kuhn Library & Gallery.